A Taste Of Love: Hot Chocolate....YUM! Here it is! I haven't blogged on here for what.... 2 years?! That's just terrible (sorry, Vandy). 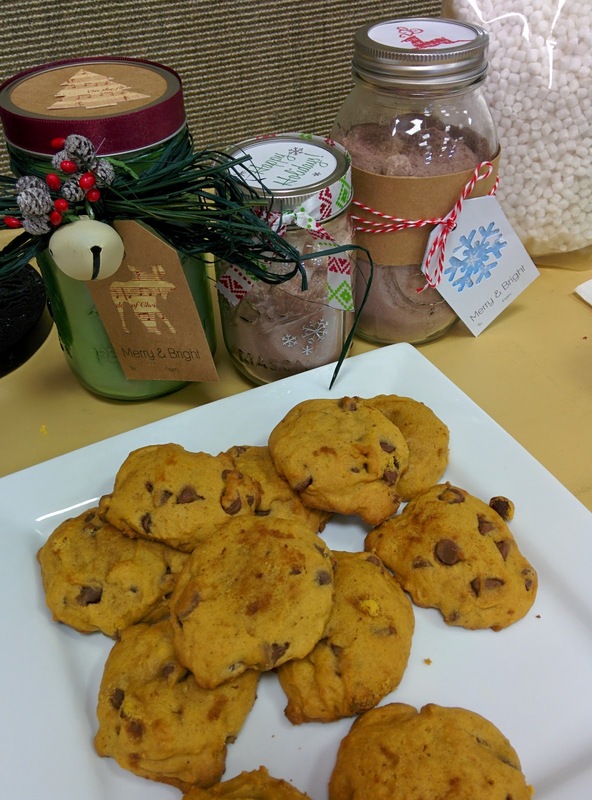 Luckily, since I need to share Hot Chocolate recipe from Super Saturday, I have another reason to blog. I wanted to be really good about maintaining this blog, but a full time job sometimes stifles my time, creativity, desire, etc. 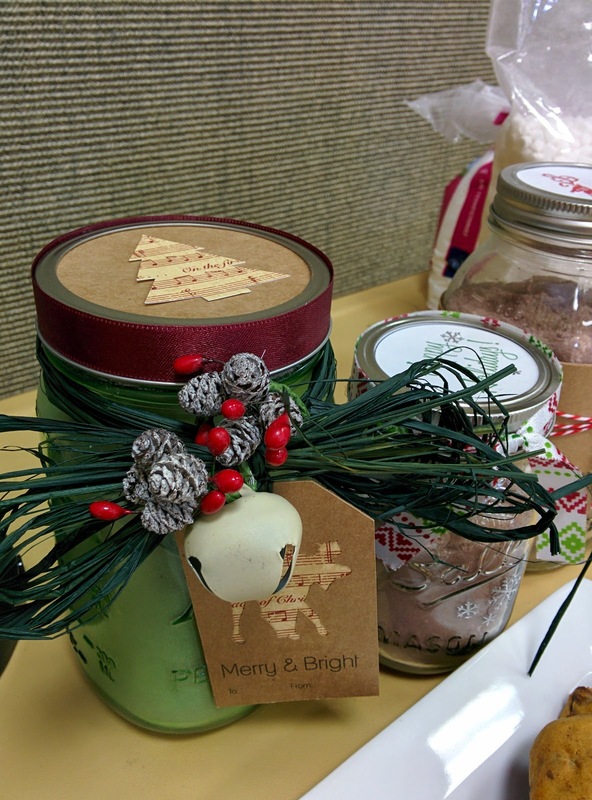 A few months ago I was asked to put together a craft/class for making jars of hot chocolate for Super Saturday (a day full of crafting awesomeness). You know, the kind of jars you could give as gifts. Last year I taught candy making and it was a blast and I was happy to do something again. These jars had been used, which is why they aren't as beautiful as they would be if we were really giving them away. I did make the tags and the jar lid toppers myself too. Courtesy of my Silhouette Cameo, which Lyle got me for our anniversary. Best. Present. Ever. Also, my pumpkin chocolate chip cookie recipe can be found here. 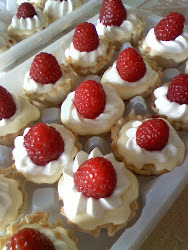 They tasted much better than they look, promise! I do love hot chocolate made with chocolate (not just cocoa), but I wasn't sure how well that would work as a gift in a jar. Trying to keep the cost down, I decided to make a mix from scratch. I started with my recipe go-to, Alton Brown. I made his recipe first with Ghiradelli Cocoa Powder and thought the mix was perfect. 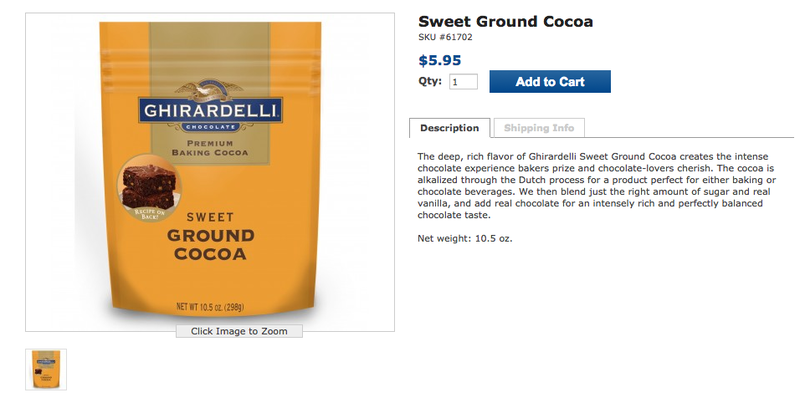 That cocoa was definitely more expensive, so we went to Costco to explore the cheaper option. Note: this was a "sweet" ground cocoa. 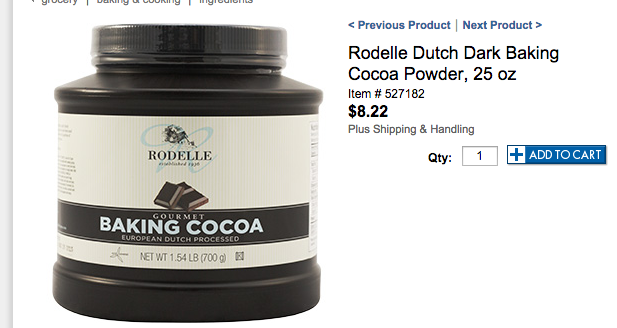 When I used this cocoa powder, which only cost about $5 in store and was by far the cheapest anywhere, the flavor changed a bit and I found that the hot chocolate wasn't as sweet as it had been when I initially made it. The flavor was fantastic (this cocoa is good), but it wasn't sweet. I like sugar and I wanted more. Hence the reason I mentioned that I needed to experiment with recipe. Luckily, Alton very rarely steers my wrong, so I only needed to change up the amount of powdered sugar and cocoa. If you are doing jars, like the pictures above, this recipe yields about 6.5 cups of mix. Enough to more than fill a quart size jar or a few pint size jars (especially if you save room for a layer of marshmallows, etc. in the jar). This mix will last for a few years in an air tight container (like a jar) stored in a dry dark place. You won't want to use the regular non-dehydrated mini marshmallows if you are planning on storing it for a long time. The dehydrated kind (link in recipe) will work better for that. Also, if you add things like creamer directly to the dry mix, it won't last as long on the shelf. *You may want to start off with this recipe, then taste your mix and adjust it according to your taste and ingredients. My feelings won't be hurt, I promise. Combine all the ingredients in a large bowl and mix it well (you can also put everything in a ziplock bag and shake it up). Store in an air tight container. You may still want more sugar, or maybe you like it less sweet so you want more cocoa.... Maybe you want to add some coffee creamers for fun flavors, peppermint, or a little cinnamon? Do whatever makes you happy! If you have any questions or great add on suggestions, please share! 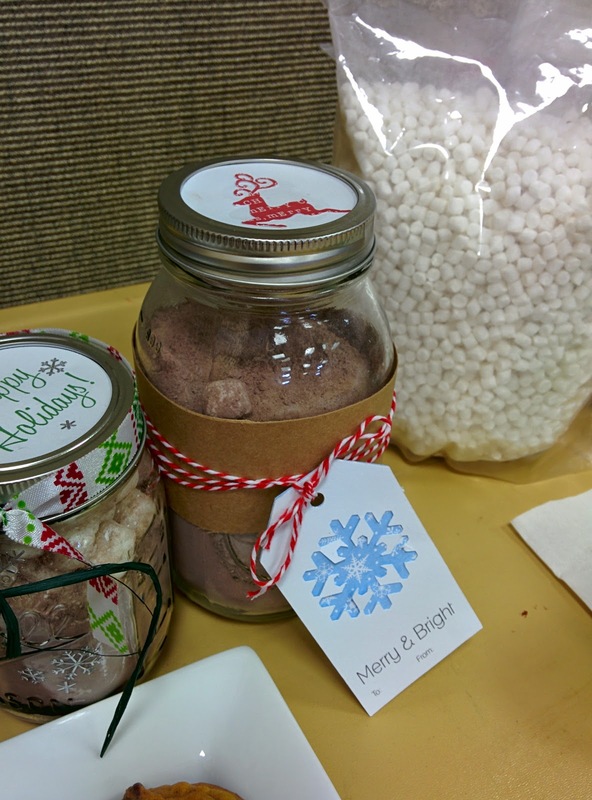 *Lessons Learned: In one of my jars that I made for an "example," I had a layer of crushed peppermint candy. I did toss it really well with cornstarch before adding it to the jar. However, I topped it with the non-dehydrated mini marshmallows. By the time I opened the jar about 3 weeks later the candy had sucked out all of the moisture from the marshmallows and formed an awesome crust that was difficult to break through. I would definitely recommend not using those two together for a gift that may sit around for awhile. Blueberry Spritzer - Easiest Mocktail Ever! My love for bacon and pears....yes, in the same dish. Welcome! 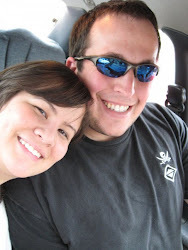 We hope you enjoy our little blog. Food is amazing. It has the ability to gather family and friends. It can be used as an artistic medium. And it expresses and defines cultures in ways that most everyone can experience. We are glad to share a little taste of our love of food with you.